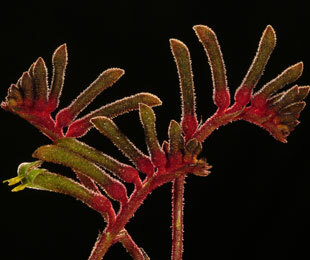 ‘Regal Velvet’ has such great foliage that it is a stand out compared to any other Kangaroo Paw available. 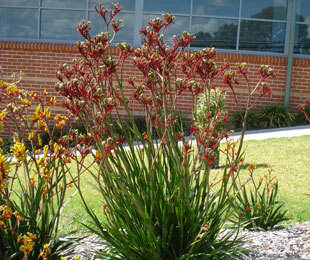 ‘Regal Velvet’ has dense, clean foliage and is much better at out competing weeds than other Kangaroo Paws; and needs less trimming or removal of older leaves to keep it looking good. ‘Regal Velvet’ is also quite a compact foliage plant (up to 50cm) with a slightly higher flower compared to others in the range. For mass planting in large landscapes, ‘Regal Velvet’ along with Gold Velvet are probably the pick of all the range. ‘Regal Velvet’ has flowers that are very attractive, with both red and green highlights. The flower stem generally grows to approximately 1 to 1.4 metres high. In show gardens it is a good idea to remove the older flowers in late summer, but for mass planted areas this may be difficult, so the stems can be left to decay on there own. To reduce maintenance on large sites, one technique is to plant ‘Regal Velvet’ behind a couple of rows of almost no maintenance plants like Tanika, or Little Jess. That way trimming is definitely optional.